1. n. Brit. A public house (pub) which specializes in serving high-quality food. In the United Kingdom, many working-class citizens frequent pubs, short for public houses. These neighborhood watering holes offer patrons a selection of cold beverages and basic comfort food known as pub grub. During the early 1990s, however, some enterprising British chefs decided to upgrade certain pubs in order to appeal to a more upscale clientele. They called their new style of restaurant a gastropub, a combination of the French word gastronomique and pub. A gastropub offers high-quality food, much of it based on traditional pub grub recipes. A plate of chicken wings or a cheeseburger may still be on the menu in a gastropub, but there is generally a comparable alternative offered as well, such as an open face steak sandwich or sauteed mussels. The typical friday fish fry may be reinvented into a variety of grilled fish entrees served with a mixture of potato varieties. Classic pub food is usually found in spirit, even if the chef applies his or her gastronomic training to the dish. The menu of a modern gastropub is generally far more extensive than a typical pub. Complex gourmet meals are often served alongside traditional comfort foods at a single table. In this context a gastropub does not compete directly with traditional pubs as much as it offers an alternative for customers who desire an upgrade. The main bar area is a large yet swank and lavish room with a long horseshoe-shaped bar. Stained dark brown support beams overhead and an ornate array of the station’s original wood working and molding line the walls. An antique model train rests atop the bar area to constantly remind you of the time that once was. Keeping in line with the railroad theme, the walls are decorated with countless items such as a conductor’s hat and red bandana and a row of railroad emblems lining the entrance way. Vintage black and white photos and paintings of old train engines fill the walls showing you of how far the world has come in the past 150 years. 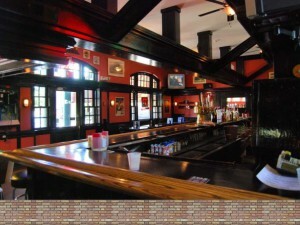 Ultimately providing for a unique experience that blends both that of a functioning pub with a historic railroad atmosphere. 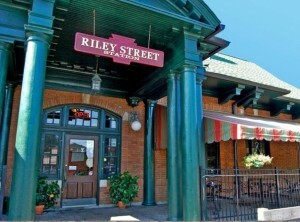 In October of 2009 the doors of the new Riley Street Station dining room were opened for our customers. The new room consists of the construction of 15′ high steel-framed glass walls, beautifully decorated interior, exquisite wood working and table tops that each display a different local railroad station from the days of the bustling Pennsylvania Railroad. The room was designed with the concept of allowing for the beauty of our building to come through without having it masked behind a solid opaque wall. 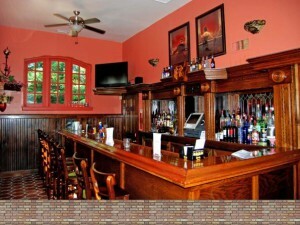 Housed inside, a large brick fireplace keeps our patrons warm and comfortable even in the colder months. In total, the structure encloses approximately 1,000 square feet of former patio space. It’s now used as a seating area, which allows us to accommodate a full dining service. In addition to just dining, we now use this separate venue to host larger events and parties on off-peak nights. All of us at Riley Street Station are very excited about this new development along with the possibilities and opportunities it will provide to both us and our customers. We therefore would like to express our deepest thanks and gratitude to everyone who has made this expansion possible. Specifically the Village of East Aurora Boards, including the Zoning Board, Planning Board and Village Board, for all their help and support in making this dream a reality. Our outdoor patios provide one of the largest outdoor seating areas in Western New York. During the summer months we are able to accommodate countless customers in our vast array of outdoor dinning. 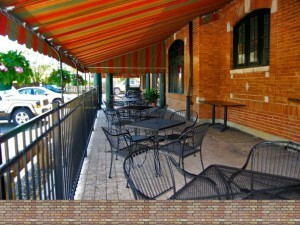 Sitting on our patios under the warm, bright summer sun or relaxing under our front awnings is always time well spent. The Gandy Dancer Martini bar was reopened to the public in the spring of 2008. This room initially served the only bar on premise when Riley Street Station first opened in the late 80’s. 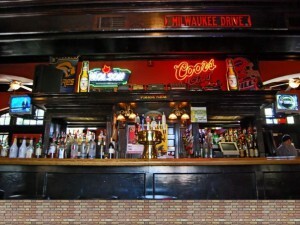 However as demand expanded, the main bar was built and the martini bar lay vacant for several years. Following the establishment’s makeover, the martini bar was opened once again to the public as a place for those who feel more comfortable in a bit of a more upscale atmosphere. Open on both Friday and Saturday nights, as well as hosting private parties, the Gandy Dancer is a beautiful room of exquisite wood working detail, providing the warmth experienced from a visit to a quaint and comfortable wine/martini bar. Offering all of the same items as the rest of the establishment, the Gandy Dancer provides the added draw of a separate Martini list for those looking for something with a little more flavor and pizzazz.